One the main reasons that we don’t do the tapping we know would be useful is that we don’t know where to begin. We have a general idea that something isn’t right, but we can’t quite put our finger on it. When we are in this situation tapping feels like a giant waste of time. 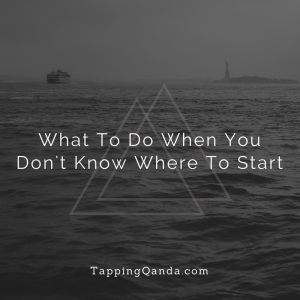 This week I have a conversation with EFT Founding Master Gwyneth Moss about what to do when we don’t know what to tap on or where to start. If you follow her simple advice, you will make great progress with your tapping!